Cecil B. DeMille and American Culture demonstrates that the director, best remembered for his overblown biblical epics, was one of the most remarkable film pioneers of the Progressive Era. In this innovative work, which integrates cultural history and cultural studies, Sumiko Higashi shows how DeMille artfully inserted cinema into genteel middle-class culture by replicating in his films such spectacles as elaborate parlor games, stage melodramas, department store displays, Orientalist world's fairs, and civic pageantry. The director not only established his signature as a film author by articulating middle-class ideology across class and ethnic lines, but by the 1920's had become a trendsetter, with set and costume designs that influenced the advertising industry to create a consumer culture based on female desire. 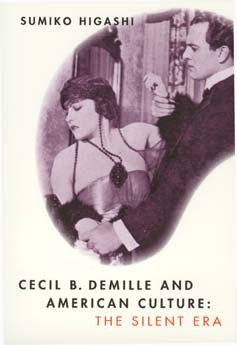 Drawing on a wealth of previously untapped material from the DeMille Archives and other collections, Higashi provides imaginative readings of DeMille's early feature films, viewing them in relation to the dynamics of social change, and she documents the extent to which the emergence of popular culture was linked to the genteel tradition. Sumiko Higashi is Associate Professor of History at the State University of New York, Brockport, and author of Cecil B. DeMille: A Guide to References and Resources (1985).